Las Vegas, host city of this year's Reem Acra Dressage and Longines Show Jumping World Cup Finals, is possibly out as host of the 2018 joint finals due to issues with the stadium size for dressage. Photo by Molly Sorge. 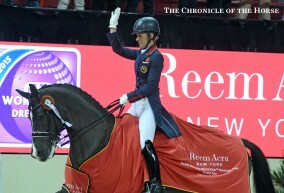 In a surprising about-face, the Fédération Equestre Internationale has reopened host-city bidding for the 2018 Reem Acra Dressage and Longines Show Jumping World Cup Finals. As first reported by Nancy Jaffer for Dressage Today, the move came on Aug. 18, despite the fact that Las Vegas seemed poised to once again win the rights after successfully hosting both the dressage and show jumping championships this spring. The conflict hinges on the dressage finals, which have effectively outgrown Las Vegas’ Thomas & Mack Center. The arena has already hosted six show jumping and four dressage FEI World Cup Finals, but it lacks the 25-30 feet of room needed for the now-required seven dressage judges’ booths. For this year’s edition of the event, several judges were forced to sit underneath the bleachers, making them less visible to both riders and viewers. Since Thomas & Mack Center managers have deemed it too expensive to expand the footprint of the arena, the location has been taken out of the running for all future FEI World Cup Finals. “We are aware that the venue is undergoing an extensive refurbishment but feel that there would be not be sufficient changes in term[s] of the size and shape of the competition arena nor in the upgrade of the internal facilities,” FEI Secretary General Sabrina Zeender said via an emailed statement. Christenson and his team at LVE aren’t giving up just yet, however. Las Vegas’ MGM Grand Gardens has an arena with plenty of room for exhibitors, judges and spectators. Unfortunately the 2018 dates are not currently available, but Christenson hopes that may change. “We have a request back in to MGM Grand, if [the dates can be made] available, we will resubmit a bid,” he said, adding that he hopes to get an answer within a week. Christenson noted that Las Vegas has “three arenas that work for this, and maybe you might even say four, and it’s coincidentally just a bad time of the year in terms of availability.” The city also hosts the Academy of Country Music Awards and many hockey games during that time of the year. The FEI has an Oct. 1 deadline for applications from any national federations interested in applying, with a decision expected by Nov. 10, at the FEI Bureau meeting in Puerto Rico.